A planned netting installation at a golf club in Brisbane poses a major risk for birds and bats. 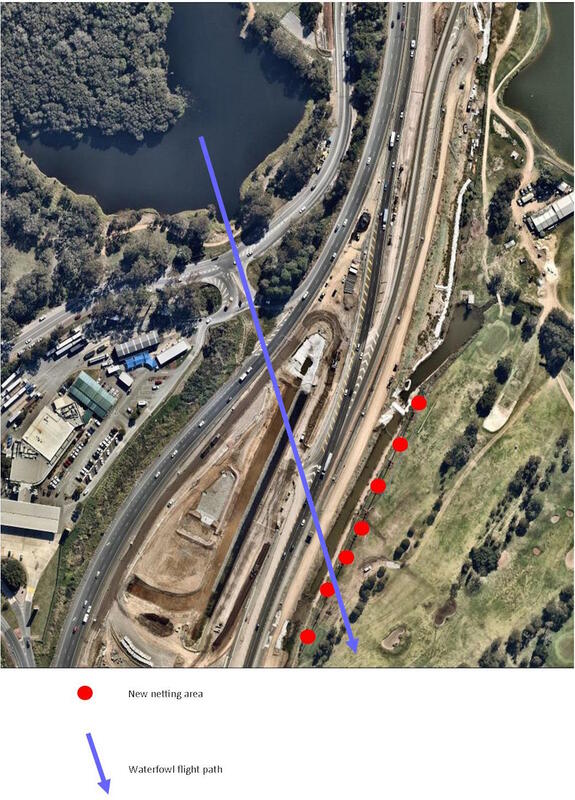 B4C and the Pelican and Seabird Rescue group (PASR) are concerned about plans by Department of Transport and Main Roads (TMR) and Nudgee Golf Club to erect netting and poles at the golf course in a well known bird flight path. This path is especially popular with the many species of water birds that frequent the bodies of water on the Nudgee Golf Course, Nudgee Waterhole Reserve, Kedron Brook, Boondall Wetlands and eventually to the Brisbane River. The move is part of the Gateway Upgrade North (GUN) project and is expected to be installed shortly. 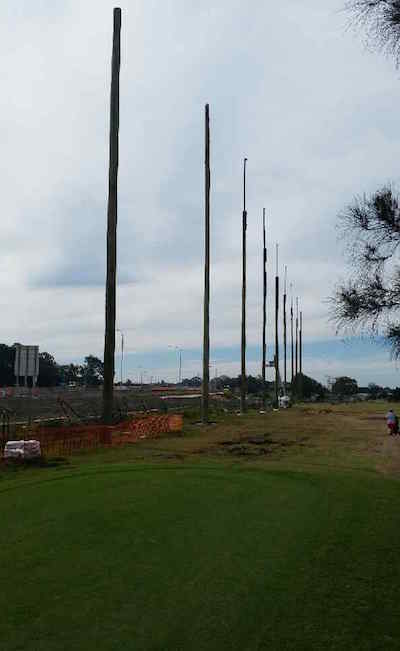 The poles (pictured) have been placed along the 17th fairway South Course of Nudgee Golf Club which is intended to house netting to prevent golf balls interfering with the oncoming traffic on the current upgraded section of the Gateway Motorway. During construction of the GUN project, the golf club changed their par 4 to a par 3 to stop golf balls escaping at this particular fairway. If they continue to leave it as a par 3, the netting will not be required. Netting poles at Nudgee Golf Club. Photo credit: PASR. PASR has tried to negotiate with TMR but has not been able to negotiate a change to their plans as yet. Hammy Forrest, a spokesperson for PASR says that birds flying from the western side will strike the large netting structure at speed causing death. Or, they will be faced with a stream of traffic while attempting to avoid the hazard. “There are many species of birds that frequent the golf course’s water features which include pelicans, cormorants and ducks to mention a few,” says Hammy. B4C’s Wayne Cameron says the solution, to keep it as a par 3, appears simple. “But this may not solve everything if golfers are currently deliberately hitting golf balls on to the Gateway and are likely to treat the netting as a challenge to hit above it,” Wayne says. Netting at an AFL ground at Alexandra Hills has been the site of several rescues and it has only been in place since earlier this year. That structure is a fraction of the size of what is planned at Nudgee Golf Club. Hammy says that netting product needs to be officially endorsed and to have been tested in terms of minimising impacts on wildlife. Important factors include net gauge size, net tension and colour. “If black is the colour of choice that will certainly increase the possibility of wildlife, especially flying foxes, colliding with the netting,” Hammy says. Wood Duck caught in netting at AFL ground, Alexandra Hills. 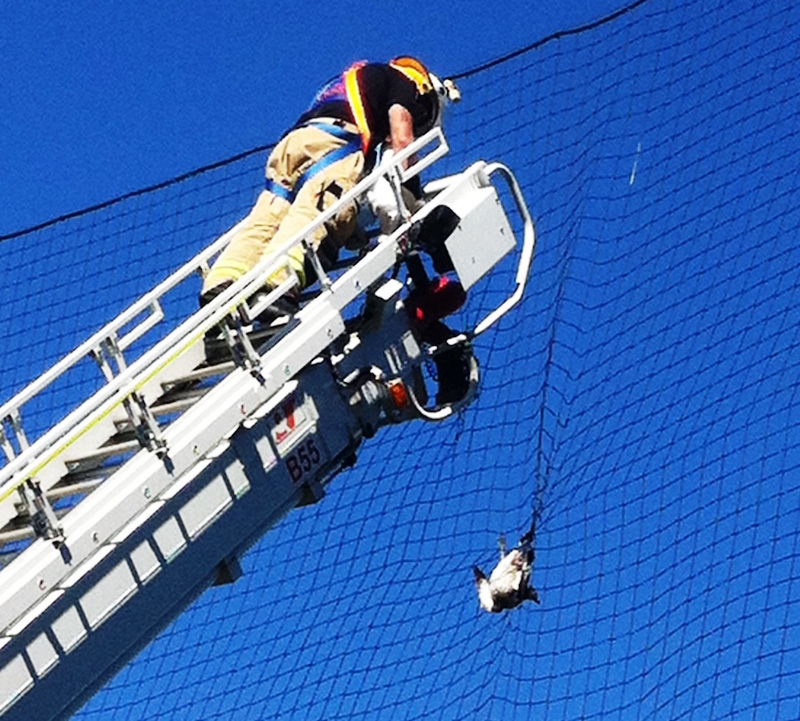 Rescue by Pelican & Seabird Rescue, RSPCA and crew from Fire & Rescue Capalaba. The smaller gauge netting may reduce wildlife being trapped, but it will not eliminate it. But it also creates an additional problem. If you care about this issue and don’t want to see wildlife sacrificed for poorly planned infrastructure please contact your local State Member. We also encourage you to add your comments and questions at the end of this article. birds, ducks, Nudgee Golf Club. How does this get approved? Who does the study to ascertain the impact on our wildlife? What can we do to get it changed? Sorry for all the questions. It also looks so ugly.